Jeff Bezos is about to launch the Kindle e-book reader at a hotel in NYC, and we're in there blogging live. Here's a gallery of Bezos plowing through device features. Jump for the play-by-play. 10:23 - Bookmarks last page read automatically. If you want to clear memory space, you delete them off of your Kindle and in 60 seconds you can get them back again. (So, 60-second downloads.) "Disappears so you can enter the author's world." The End. 10:18 - Look at the store: your recommendations, national bestseller list. Buy something: scroll with your select wheel, select title, pull up detail page. What you would expect with Amazon.com - cover art, editorial reviews. Print list price $35, Kindle price is $9.99. Click on Buy. Says "thank you for your purchase...you can continue shopping while you are downloading." GREAT FEATURE: "Purchsed by accident? Cancel this order"
10:15 - Feature run through: font size change; "select" wheel; add highlight, annotation — all saved on server side so you never lose your annotations; dictionary - looks up every word in the line, then you can select each word. 10:05-10:13 - VIDEO: The publishing world rallies around Kindle. Toni Morrison, Neil Gaiman and other luminaries say that they love Amazon and the Kindle. Mostly promotional, but we have captured it in case there's anything exciting buried in there. 9:55 - "EV-DO, fastest wireless technology, it's broadband. Highly deployed. Use it while you move around. Everybody knows when you use wireless cell networks, there's gotta be a data plan, multiyear contract, monthly bill — we didn't like that either. We built Amazon Whispernet on top of Sprint's EV-DO network. No data plan, no multiyear contract, no monthly bill — we pay for all of that behind the scenes so you can just read." 9:47 - "I have nerd credentials." (And a big crush on his elementary school teacher Mrs. McInerny.) But can you improve on something as well suited to its task as the book? 1. It has to fade away for the reader, like a book does, "so you can enter the author's world." 2. We can never outbook the book. We have to take modern technologies and do new things that the book can't do. 9:45 - Bezos says why books are the last remaining analog product: The format (glue and paper) fades away, "and what remains are the author's worlds, the author's words. I'm a reader." 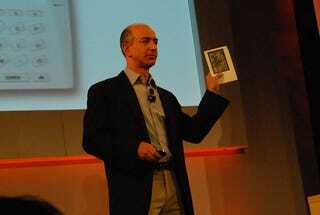 9:40 - Bezos on the codex: "Gutenberg would still recognize a modern-day book."